Requirements for casting lead: Great hair? Check! Great chin? Check? Great actor? Well…two out of three not bad. 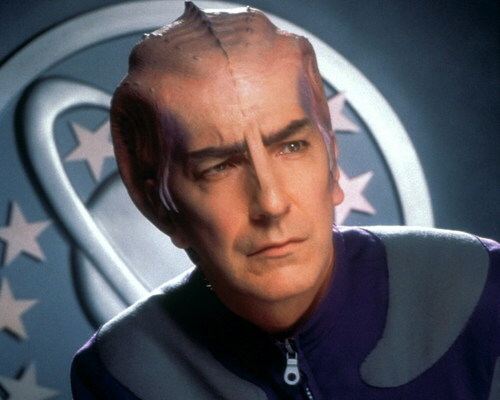 Galaxy Quest either a love letter, or scathing editorial, of SF t.v. fandom. Which way you interpret film will dictate your response. Monster not a huge scifi fan. When me see police box, me not automatically tink time travel device but good place for stacking policemen or emergency porta-potty. And while me not know able to tell difference between a Minosian and a Mintakan, me familiar enough wit likes of Dr. Spock, Bubba Fat, and Lando Kardassian to get humor of de movie and NOT be offended. 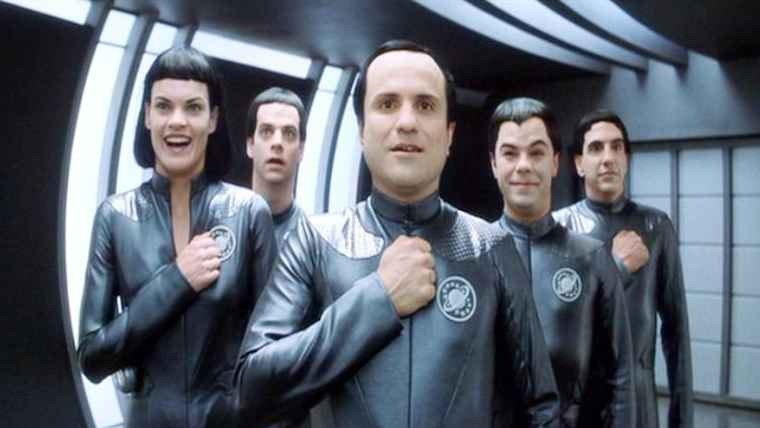 Movie begin at fan convention for much-loved SF series, Galaxy Quest dat similar to t.v. version of Phantom Menace, though not as cheesy. All former cast present for panel and autograph session including douchebag former lead. But science fiction becomes science fact when former t.v. 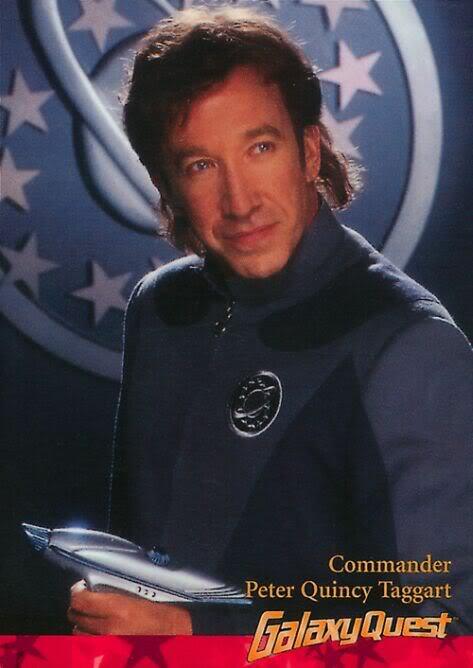 Commander get enlisted to help group of aliens resist machinations of evil lizard beings. And before you can say “Grabthar’s Hammer”, he be joined by rest of his reluctant co-stars in an epic space-faring adventure. Give him a hand. He’s British! De movie poke fun at scifi t.v. tropes as our fish-out-of-water heroes assume de personas of deir fiktional counterparts, referencing an old t.v. show dat deir alien allies believe to be aktual “historical records”. It all lead to aktion, adventure, a surprising amount of pathos (Yes, he be one of the Tree Musketeers! ), and lots of laughs. It culminate in a thrilling albeit incredibly stoopid climax involving highly convenient time travel. Boo! Still a very good, very funny movie dat give Monster newfound respekt for you pasty-faced geeks. Verdikt: Me want to rate it even higher, but dat time travel twist at end be a disappointing cop-out. Rating: 8.5 chocolate chippee cookies.